It’s safe to assume that iPad 2 will have dual cameras, shed some weight, and likely even have a higher resolution screen, but that’s not enough for the rumor mill. The latest claim surrounding the popular tablet is that an unspecified smaller iPad will soon be offered alongside the regular 10″ version. This rumor comes from Reuters, who cites several hardware manufacturers in Asia as their source. The Reuters article also cites dual cameras coming to the iPad, which isn’t a surprise when recently leaked iPad 2 case designs clearly show a rear port for a camera. Does a smaller iPad make sense? In many ways you could argue that the iPod touch is already a mini-iPad, and this feels even more true when you use the iPhone or iPod touch in landscape mode thanks to a jailbreak hack that realigns the iOS GUI to function horizontally. Will Apple create a device that fits between the two devices in screen dimensions? Why not just increase the screen size of the iPod touch and iPhone to 4″ instead? Several Android phones have proven it’s possible to maintain a slim design while achieving a 4″ screen, and just looking at an iPhone and iPod touch you can see where there is room to expand the display. Just a thought. I generally trust Reuters as a reporting agency, and they certainly have better sources than your average rabbit-in-a-hat Apple rumor fabricator. Nonetheless I am skeptical of this claim, I think it is more likely that the 10″ iPad model will be reborn in a slimmer and lighter enclosure, rich with the features that everyone is now expecting, and some that we aren’t. 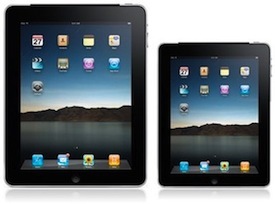 With an expected early 2011 release for iPad 2, we’ll find out soon enough. I think the chances of a small iPad are pretty good. One thing we DO know is that Apple has an obsession with miniaturization: the MacBook Air, iPod nano, Mac mini, et al, so a smaller iPad wouldn’t be shocking in this context. Why not release a 6″ or 7″ iPad? I don’t buy Steves dismissal that the screen sizes are too small, how he could say that with a straight face while having an iPhone in his pocket is comical at best. Regarding your idea of a 4″ display on the iPhone and iPod, that would be very welcome. The Galaxy S has a 4″ and that half inch makes a big difference when comparing the sizes side by side. 3.5″ is a business card, that just won’t cut it in the near future.